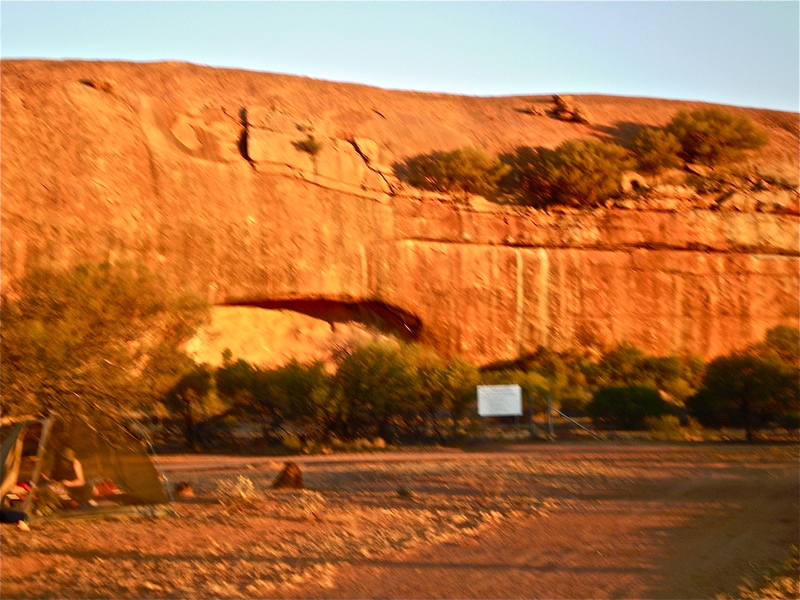 Walga (Walganna) Rock, 1.8 km long and composed of post-tectonic granite, is one of the many whalebacks scattered throughout the Yilgarn Craton. Situated on the Western section of the craton which consists of rocks of every Archean era with zircons dating back to the Hadean also clastic sedimentary rock. It consists of K-feldspar porphyritic monogranite that forms the type area thought to be approx. 2.5 billion years old. 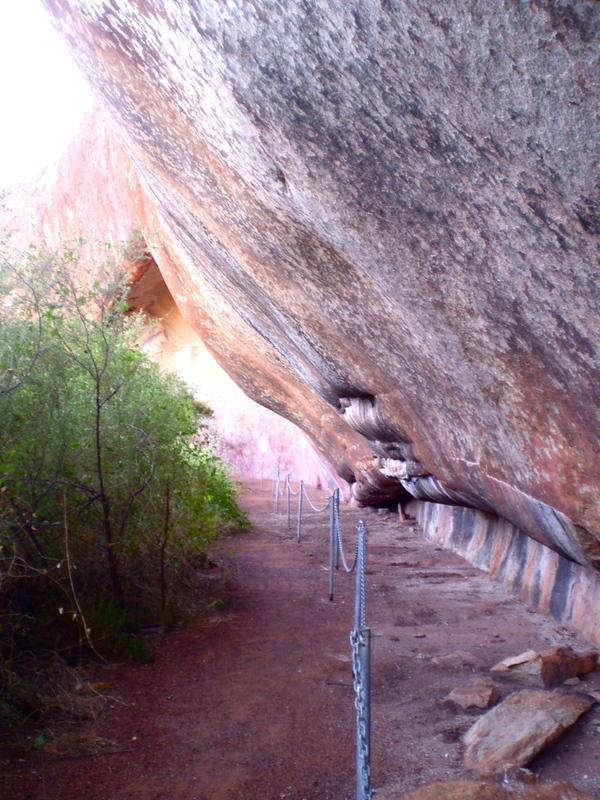 Walga Rock cave entrance before sunset. Above the gallery situated on the cave wall are large slabs of granite in the process of ‘peeling off’ the main rock form. This process is caused by expansion and contraction of the surface because of extreme seasonal and diurnal temperatures in this inland (300 km), arid climate. 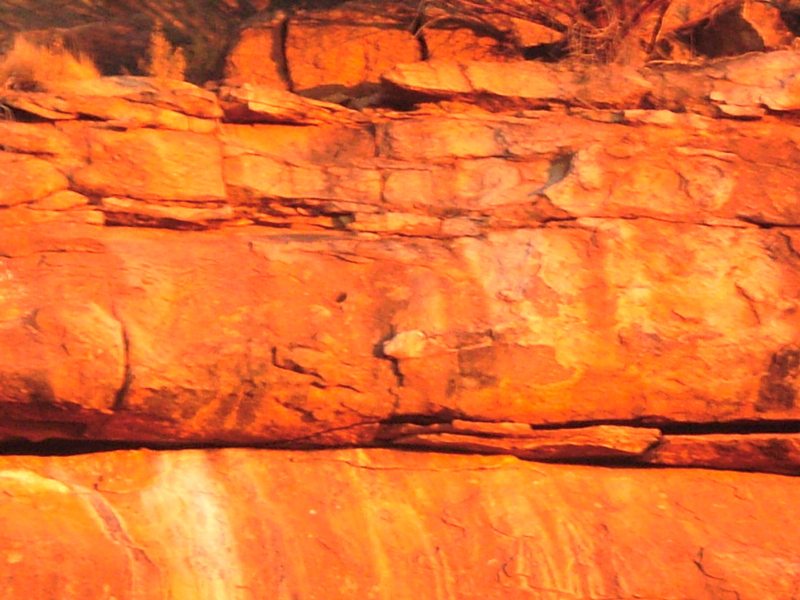 Rain water and wind erosion molded and eroded the lower recessed section of the rock. Walga Rock wind and rain water erosion ‘ peeling off ‘ slabs of granite. Wind and water erosion forming cave wall. I took a rubbing/frottage from rocks as well as rice paper stains from soil far from the enclosure. They are a way for me to connect with the place via a tactile experience when I return to my studio. Often I adhere them with gesso to the canvas surface. 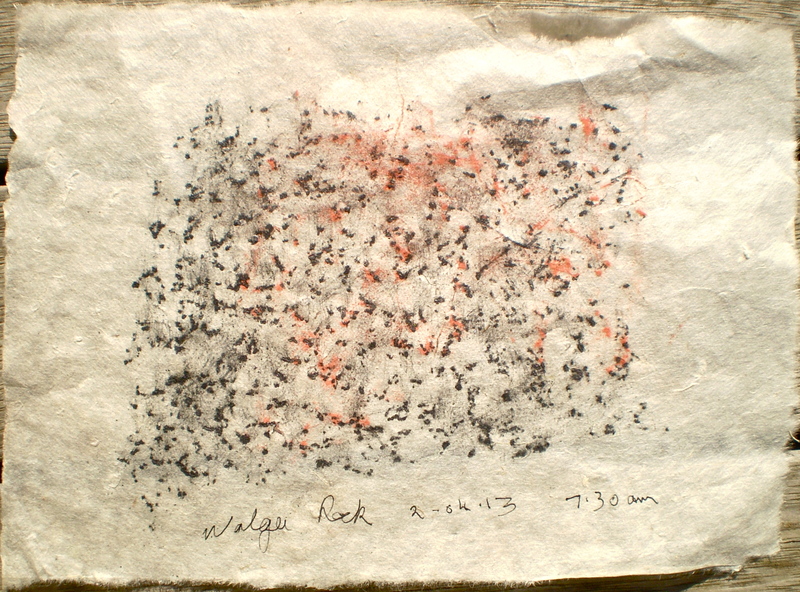 Walga Rock frottage, 22/04/13, 7.30 am, graphite and pastel on rice paper. 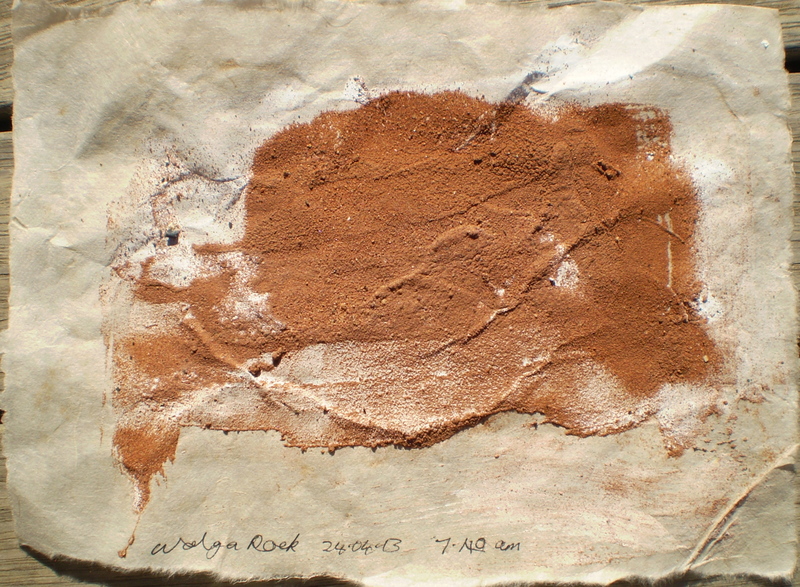 Walga Rock paper stain 1, 24/04/13, 7.40 am, soil stain on rice paper. This technique is one that includes quick sketches done on site. 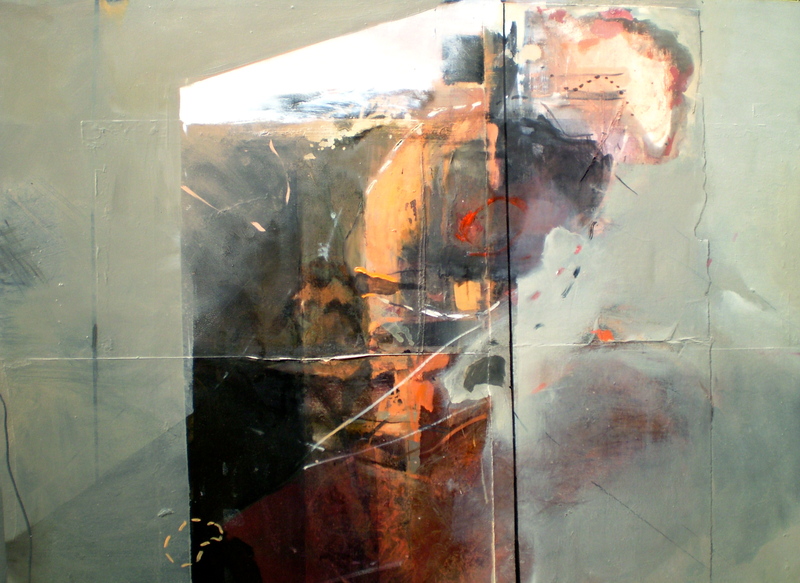 Below are previous examples of this mixing of different media which I meld into large oil paintings. They may be viewed on my website : desterreart.com.au and are part of a series titled An Archaeology of Landscape. from the series titled An Archaeology of Landscape. Courtesy of the D. Hutton collection. from series titled An Archaeology of Landscape. P.S. Correction: Feldspar should read K-feldspar. The “K”, refers to the Potassium content of feldspar. There are 3 K feldspars: microcline, sanidine and orthoclase (orthoclase and plagioclase, another type of feldspar, are often easily seen in volcanic rocks, they’re usually a milky to pinkish white). 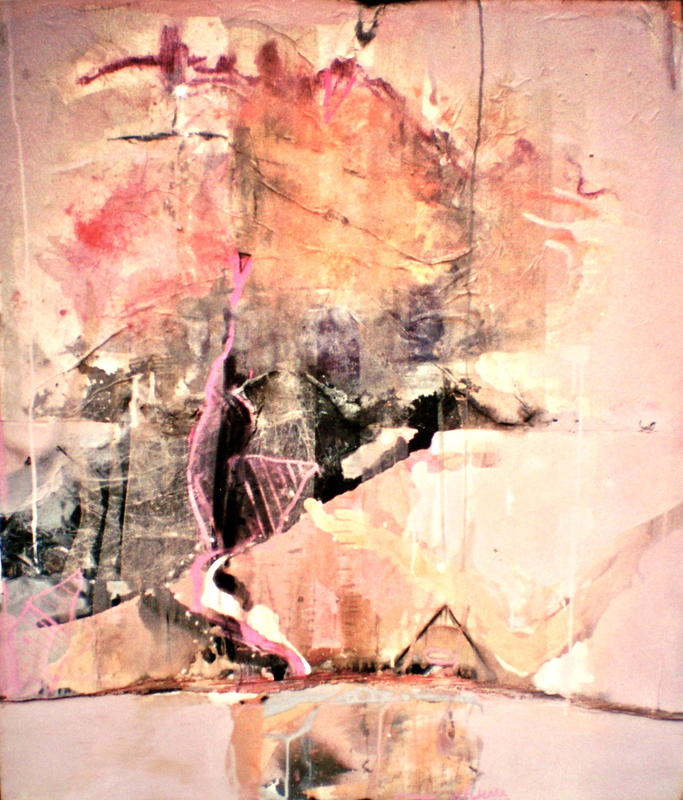 Categories: Drawings, Mixed Media, Oil Paintings, Preliminary photographs | Tags: An Archaeology of Landscape, cave entrance, contemporary, environmental art, Frottage, geology, mixed media, preliminary photographs | Permalink.